Stephanie Gladden Miller, and are printed on 100% cotton American Apparel shirts. Choose this T-shirt and show your support for Iris McLeod, creator of the only perfume proven to make its wearer seem trustworthy. Perfect for the undercover Irregular—only the French will know what you’re up to. $14.99. Available in Light Blue. that you’re not a person to be messed with. 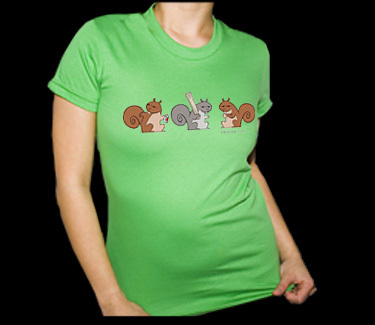 A fierce posse of giant squirrels has your back! Ideal for animal lovers, graffiti artists, and amateur anarchists. $14.99. Available in Grass Green. New York’s infamous girl mastermind agreed to pose alongside her trusty Vespa for this fabulous shirt. She was in an unusually good mood that day, but she probably won’t look so pleased when she discovers that an irony-loving artist made her T-shirt pink!